Johnsons Poultry Mite and Lice Powder offers a natural, organic solution to treating poultry red mites and lice. This naturally occurring powder effectively dehydrates the insects. 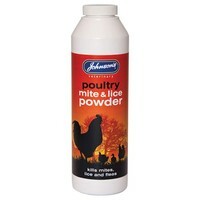 Johnsons Poultry Mite and Lice Powder can be applied to both coops and directly to birds, it is also safe to use on laying chickens.